One game sample-sizes are a terrible way to judge the merits of a baseball player, but since my time in Arizona is so brief, I’m being forced to evaluate players based on just one game of action. 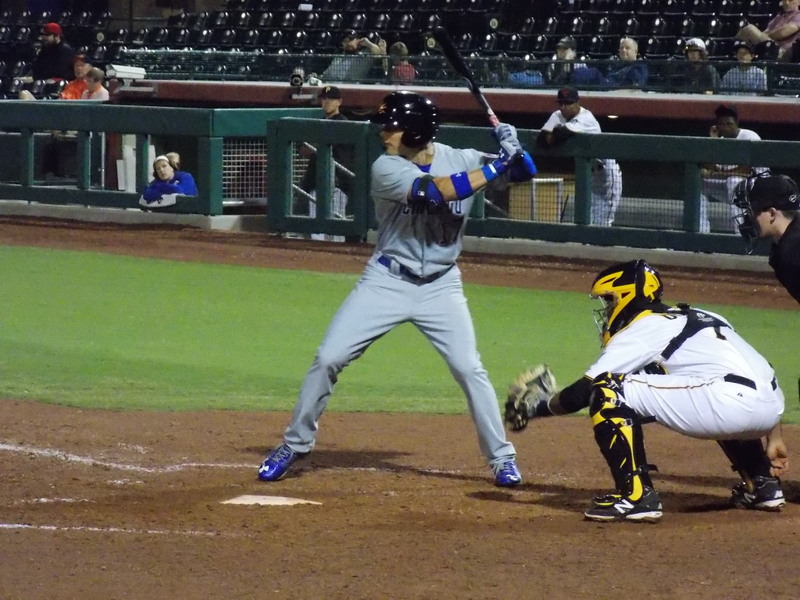 Here are my snap judgments on some prospects for the Chicago Cubs, who fell in Arizona Fall League action to the Scottsdale Scorpions by a score of 2-1 on Monday night in Scottsdale. Cates only faced one hitter in the bottom of the fifth inning, retiring Roman Quinn on a groundout to shortstop. It was a very well located pitch that he induced the grounder on, and I really wish that he had faced more batters in the game. Unfortunately for me, all three of the Cubs’ hitters who started this game struggled at the dish. Hannemann was just 1-for-6 entering the evening, and he left without helping his average at all. In fact, Hannemann hit with runners in scoring position on three different occasions in the game, and he grounded out to first base, flew out to center field, and struck out in those situations. 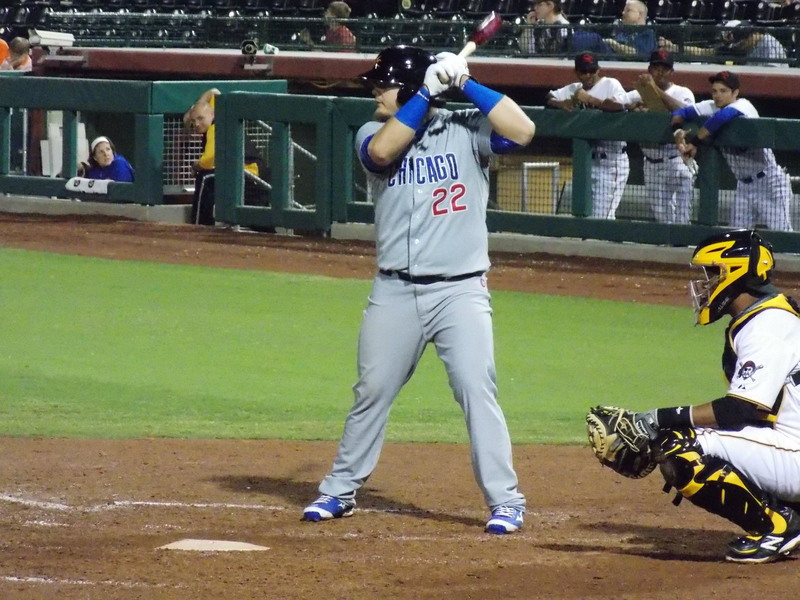 Vogelbach bats vs. the Scottsdale Scorpions in AFL action. Even though he had an off-day at the plate, Hannemann made up for it with a couple of nice defensive plays, including a slicing ball down the right field line that he was able to cut off and hold Tyler Austin to just a single. His throw to Addison Russell wasn’t perfect, but it got the job done as the Solar Sox looked to keep their hopes of winning the game alive. 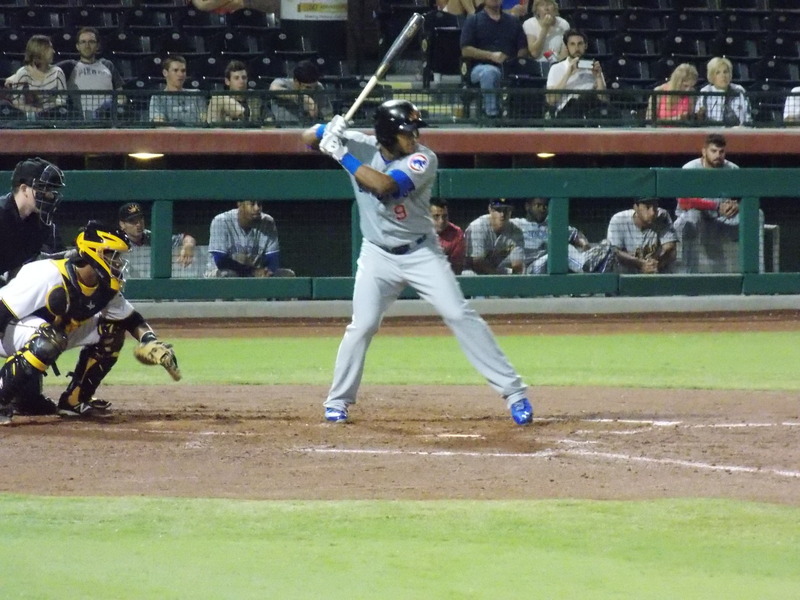 Out of the four Cubs prospects that I saw on Monday, none impressed me the way that Russell did. No, he didn’t blow me away at the plate (although his sharply hit single to left field and his ninth-inning walk were both good to see), but his work with his glove was jaw-dropping. In the bottom of the fifth inning, Russell (playing second base in this game) was positioned at normal depth against right-handed hitting Blake Miller. On an outside pitch, Miller lifted a fly ball that sliced down the right field line and looked like it was headed for trouble. Getting to full acceleration in just a few steps, Russell was able to somehow get under the ball and make a remarkable running catch to retire the batter. Not content to let that be his only web gem, Russell came up with an even better one in the bottom of the seventh inning. Elias Diaz smacked a ball up the middle of the field, just eluding the pitcher. Sliding on one knee, Russell made an excellent pick of the ball, and from that knee he rifled a throw over to Dan Vogelbach at first, and when the Cubs’ first base prospect was able to scoop it out of the dirt, the runner was retired. Hannemann bats for the Solar Sox in AFL action. Both of those plays showed why Russell is such a highly touted shortstop. His range is incredible, his arm is strong, and most impressively of all, he made it look ridiculously easy. If Starlin Castro is looking over his shoulder during the 2015 season, fans will know why. Vogelbach’s immediate comparison player is Javier Baez. He strides up to the plate looking like he can hit the ball a mile, but if anything offspeed came near the plate in this game, he was swinging and missing. He struck out with runners on second and third in the first inning, struck out again in his next at-bat in the third, and grounded out softly to third base in this third trip to the dish. He finished off the evening by grounding into a fielder’s choice in the top of the eighth inning. Even though Vogelbach has struggled at the plate during AFL play (he’s now 1-for-11 with seven strikeouts and three walks), his glove work did give him something positive to build on. When pitcher Felipe Rivero fielded a high chopper near home plate, he ended up throwing the ball directly down the base line. Vogelbach not only was able to pick up the ball out of his hand (not an easy thing to do with a baserunner bearing down on you), but he was able to pick the one-hop throw out of the dirt to get the out at first base. Maddon Looking to Give Castro Work at Second, But Should He?